Pew study on Internet romance: Online dating is more normal than ever, but some still think it's desperate. 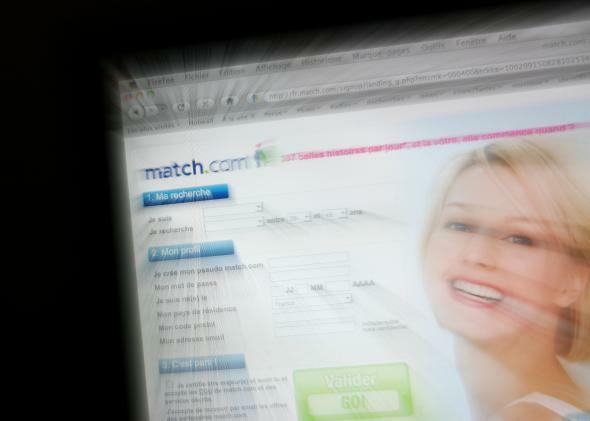 Match.com and sites like it are still seen as a little sad. We are living in a time of great transition for digital romance. A new study from the Pew Research Center’s Internet and American Life Project, released Monday, found that 59 percent of American Internet users believe that “online dating is a good way to meet people,” a 14-point jump since 2005. Among Americans who identify themselves as “single and looking,” 38 percent say they’ve used a dating site or app to try to meet a match. But 21 percent of plugged-in Americans still think that “people who use online dating sites are desperate.” (In 2005, 29 percent of them said so.) Even 13 percent of people who date online consider themselves desperate. Though online dating has become normalized, it’s still seen as a little sad. Tinder also lowers the barrier between checking someone out online and actually meeting him or her in real life; it’s only showing you geographically optimal options, and its interface prioritizes short, flirty texts, not romantic dissertations, which can help preserve excitement and temper unreasonable expectations. While some of the matching questions on places like OkCupid can tell you important things about a potential partner—does this person think abortion should be legal or believe that gay marriage should not? —they can’t predict whether users will actually have chemistry with each other, which is maybe not the most important aspect of a lasting connection but is certainly a requirement to get things started. The brevity of the Tinder exchange also means that using the app is easier to integrate into our daily lives than the drawn-out profile curation typical of a place like Match. Still, Tinder feels like a stopgap solution wedged between the online dating ghettos and the full integration of the Internet into our romantic lives. Pew also found that the proportion of online Americans who use any Internet platform to flirt is increasing dramatically—24 percent of today’s Internet users have flirted with someone online; in 2005, just 15 percent had done so. As online dating becomes more normal, and less desperate, we will feel less incentivized to segregate our online romantic dealings from our digital business connections and social spaces. That will mean that people will meet online closer to the way that we have always fallen for co-workers or friends of friends in person. No algorithm required.